The £5 Lottery Club is helping to fund exciting projects for children on our island. We are delighted to have been supporting Friends of Frossard Children’s Ward since 2014, who have been using funding to buy great medical equipment and furniture like beds and bedding – enabling parents to stay close to their children while they are in hospital – and much more. Scott and Cathy Gallienne spent time on Frossard Ward with their daughter Lily-Mae twice in 2012 when she was only four and a half months old with meningitis and at six months with severe bronchitis. 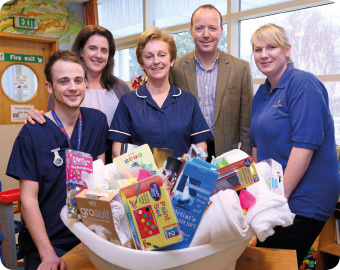 Soon after, they decided to set up the charity as a way of thanking the nurses and doctors on Frossard Ward and to support other children and parents going through similar difficult and emotional times. We are so thankful to Scott and Cathy for the great work they are doing, and are grateful to be able to partner with them through the £5 Lottery Club and support Guernsey’s children and their parents in this way. Thank you to our £5 Lottery Club members for making this possible.